Ableton Live 6 CSi Master - Get ready to master the key operational techniques and cool new features of Ableton Live 6! 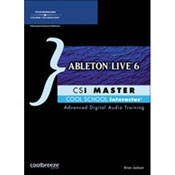 "Ableton Live 6 CSi Master" is a hands-on training DVD-ROM that provides you with a unique way to take your music to the next level. If you've been using Live and you want to get more out of your rig, then you've come to the right place. You'll cover the major topics as you work through more than four hours of movie tutorials. If you're a new user and need to get up to speed with Live, use the Introduction topic to take you through set-up, basic definition, and the new features added in Live 6. Ableton Live 6 CSi Master is full of movie tutorials that include not only basic functionality, but also production techniques, special shortcuts, key commands, and before and after audio examples. Work your way through easy-to-follow tutorials, including What's New in Live 6, File Browser, Hot Swapping, Session To Arrangement, Warp Modes and Markers, Sampler, Built-in MIDI Effects, Operator Automatic Tempo, and much more!